I can not help but feel despair after reading Fareed Zakaria's advice to Untied States in Newsweek on what to do about the Islamic Republic on the nuclear issue. I feel despair because it makes me wonder, how did these experts get their jobs? Was it just their family ties or did they really do well at school? Do they have any experience in manipulative politics to give such advice? Looking at Fareed Zakaria's photo, I get the impression of a slippery slick city lawyer. The sort that know how to waffle on about something and impress the plebs in a jury. Reading his article however, I get the impression that this guy needs to go back to school and do a an elementary course in statistics. 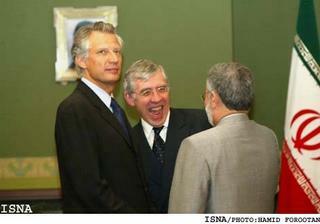 "Many Iranians believe that they should and will be a nuclear power. I was speaking to an Iranian exile who lives in London who has spent time, money and effort plotting against the regime. For the first time ever, I found he was siding with the mullahs." Do you see what I mean? Fareed Zakaria has talked to one obscure nameless Iranian exile in London and has extrapolated that many Iranians want to have nuclear power! Absurdity beyond belief. He then rants on about "sticks are not going to work" and if the objective of the US is to stop the Mullahs from having nuclear weapons then why not explore a different path? Anyone reading this would think that in the last 25 years the US and the EU have used sticks against the mullahs and now a different path should be explored as another experimental method! However for those who may not have followed the Iranian affairs closely in the last 25 years, the truth is that the US and particularly the EU have been failing miserably with a softly approach which the EU like to call a critical dialogue. Although it is neither critical nor a dialogue. In fact the one method which has not been tried against the Mullahs is sticks. Don't get me wrong I am not talking about air strikes which could result in the death of the civilian population either. I do believe however that certain Islamic Republic figures should be arrested if they travel to US or Europe. Some even already have warrants issued against them by European courts. The same courts that were put under unprecedented pressure by their governments to adopt a softly approach against Islamic Republic's campaign of terror against its dissidents in Europe. Or just lets advice the US firms like Halliburton not to take on contracts in Iran or even easier options; ban the Western technology firms from selling internet filtering software to repressive states like Islamic Republic of Iran. If I was an adviser to US however, I would advise them to back the secular pro-democracy movement in Iran. For this is the biggest fear of the religious dictatorship in Iran; the international support for the uprising at home. They would tremble under their turbans if for once they see magazines like Newsweek giving coverage to Iranian dissidents like Akbar Ganji or report the massacre of people in Iranian Kurdistan by Islamic Republic helicopter gunships. Then the international public opinion would also understand that a state which uses helicopter gunships to massacre its own people can not be trusted with nuclear technology either.